Local Buckhurst Hill cub scout leader graduates from University. A local cub scout leader who has been working with children in the Essex area for more than seven years was among over 1,500 students who graduated from City University London this week during ceremonies held in London. 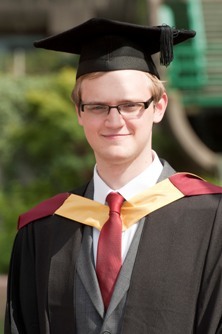 Daniel Sadler, who lives on Buckhurst Way road, completed a Bachelor of Science in Psychology at City University London and is the first member of his immediate family to graduate from University. His proud mum, dad, and brother all joined him at the graduation ceremony. During his studies Daniel has balanced his time with his commitments to the local scouts groups, where he is an Assistant Leader after joining more than 3 years ago. Daniel says studying psychology wasn't easy, but definitely worthwhile. "Being a scout leader you have to constantly plan new activities that will keep the kids entertained, as well as deal with things like behavior management and different personalities. Studying psychology was really helpful in terms of helping me understand and relate to both the children and parents I deal with.